Pluck and clean the birds. Roughly chop the cheese and egg, place in food processor and add almond, herbs, salt and spices. Process until mixture is firm and cohesive – somewhere between a paste and a crumble. Rub inside of larks with salt, then stuff cavities and tie them shut. Lightly oil a casserole dish with a cover. Place a layer of stuffing on the bottom. Put the birds in this. If there is any more stuffing put it on top of the birds. Cover and roast for 30-45 minutes. Uncover at the end of roasting time to brown the breasts. Allow the roast to rest for 5-10 minutes minutes when done. Remove the stuffing and put it into pastry shells. Serve larks whole with a plate or bowl for the bones. They should be eaten with the index finger and thumb of the right had in the medieval fasion. *This recipe can be used for roasting a 2 lb chicken for dinner. Then the stuffing is placed under the skin of the bird. Roasting time would be 45 min - 1 hr. After roasting it is left to rest 15-20 minutes before carving. A very raffinate recipe, good for big ocsssions and holidays; the stuffing in the pastry shells makes a great appearence! 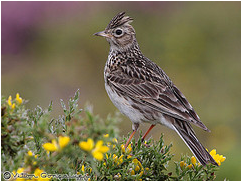 I think it could be done also with partridges or quails, even pheasants (but these are more difficult to find in Spain). Of course wild birds have been replaced by those produced in farms. Wild birds were in old times provided by shooting and other methods, specially the use of nets (now forbidden because they caught every kind of birds indiscriminately, even the protected species). "Liga" or glue in the branches of trees was in use until the 1960-1970's, and little boys in the villages used slingshots as a favourite sport until the 1950-60's (see Camilo José Cela and above all Miguel Delibes). Spain is still privileged to have a vast variety of wild birds although pheasants are breed for aristocratic hunters. Beaters push them into shooting zones for the hunters to kill them in flight by the hundreds. German birdwatchers come to Extremadura for Holy Week just to bird watch because there are so many migratory species passing through which have disappeared in Germany. Autumn is another spectacle of migratory birds in Spain. 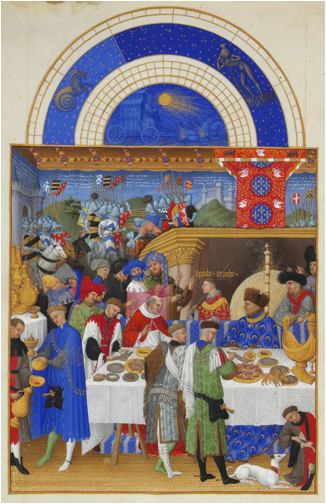 As Enrique de Villena explains, Spain was a rainbow of small bird populations during the Middle Ages. The 1st Duke of Albuquerque asked Henry IV of Castile, Isabel’s older brother and king for 20 years, for Cuellar, a town in Segovia, which is on a major migratory route as he was an avid bird hunter with bow and arrow before the beater system became the fashion among the upper class. During the same period, the Marquis of Villena, the First Minister, acquired the town of Villena and other domains in Valencia, Alicante, and Cuenca, among others, for the same reason. 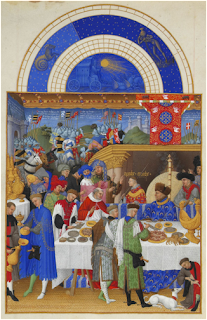 Small birds were synonymous with fine eating and medieval hospitality in abundance.